Barnes & Noble has this week reduced the prices of its range of NOOK tablets, in preparation for a new updated version to be released late next month. The new NOOK tablet that is expected to launch in late September, will be equipped with new display technology, its thought. As well as being lighter and including more media options for users, yet still providing a solid e-book reading device. 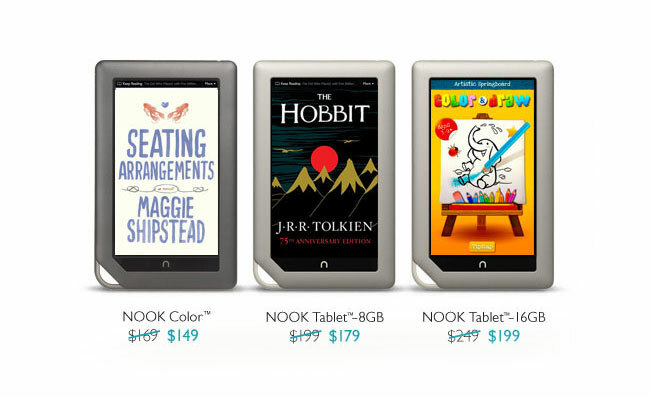 The range of current NOOK tablets have now been reduced to $179 for the 8GB NOOK Tablet a $20 discount, $199 for the 16GB NOOK Tablet, a $50 discount, and $149 for the NOOK Color, a $20 discount. To recap the NOOK Tablet is equipped with a 1 GHz TI OMAP 4 dual core processor, and the NOOK Color is powered by a 800 MHz single core TI OMAP3 processor.